Sweet Romance Reads: The mighty pav! Here downunder it is (supposedly) summer and so our Christmas celebrations tend to be eclectic. A lot of folk will do summery food with barbeques or picnics at the beach, taking advantage of all the fresh goodness summer brings, while others will go for a full-on roast meal. My Canadian friends will insist upon turkey and maintain we Kiwis just don't know how to cook it right, which is possibly quite true. 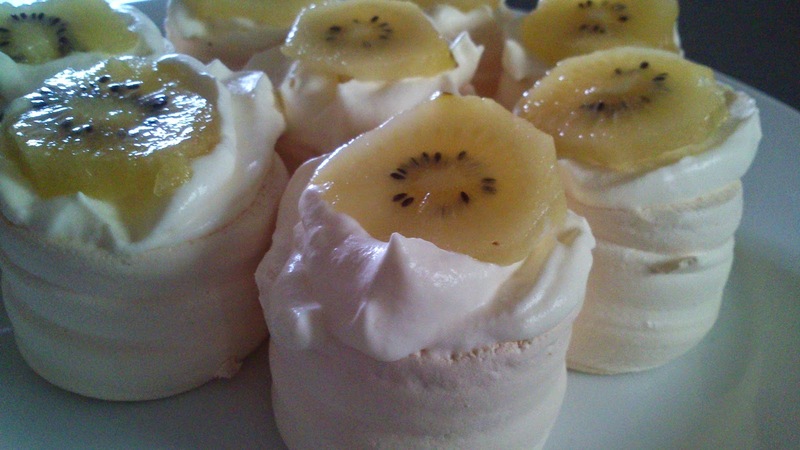 But despite your foodie preference over the season, one thing most Kiwis (and Aussies) love is Pavlova. I mentioned the good old Pav on SRR a while back and have been salivating over the opportunity to speak to this most wonderful downunder dessert ever since. Or it's us, the people! Pavlovas are dead cheap to make as they're basically sugar and egg whites mixed up and baked at a low temperature. They can, however, fail to rise but all is not lost if it's just a flat crispy meringue you end up with (which is usually what my pavlovas end up like, to be honest). Just break it up and layer it in a glass with whipped cream, fruit, maybe some grated chocolate on the top and dig in. Below are the mini pavs with kiwifruit! Just like the turkey in North America, Christmas wouldn't be Christmas without a Pav, so maybe over the New Year, our readers across the world can share some of the Kiwi love and give it a go. Here's a link to a recipe from a well known Kiwi sugar website that is appropriate given most of the ingredients in a pavlova is sugar. Sounds delightful, Joanne. I used to go to a restaurant where they did schaum tortes which are strawberry meringues. YUM! They look delicious, but I'm not sure I'll try to make them. For me, the simplest things, like meringue and pie crust, are the hardest to make. They remind me of divinity (little pillows of flavored meringue). Yum! I love Pavlova! So yummy. I've made a chocolate one for my gluten-free friends - and they loved it. Thanks for sharing this! I like the failed pavs sometimes as much as the marshmellowy ones. I was thinking of buying the mini ones for Christmas this year (although having a stomach bug I wonder if I will want to eat it). Sounds interesting. Will have to try some day. We have pavlova at Christmas as well, in the UK. My sister is the pavlova queen and always brings one. She normally decorates it with whipped cream and strawberries. I can't wait!